URBANA, Ill. – With the rise of herbicide-resistant weeds in most grain and vegetable crops, farmers are looking for alternatives to herbicides to control weeds. Cover crops offer one potential weed management tool. Their use in specialty crops is limited, and no testing has been done so far in edamame. However, a new University of Illinois study reports that early-killed cereal rye shows promise for edamame growers. "Early-killed rye reduced weed density by 20 percent and suppressed early-season weed growth 85 percent," says Marty Williams, an ecologist with the Department of Crop Sciences at U of I and the USDA Agricultural Research Service. Edamame is notoriously hard to get started. The soybean variety's large seeds make them good for eating – edamame seeds are consumed at an immature stage, when they're firm and green – but the crop can suffer from low seedling emergence in the field. Williams wasn't sure that asking them to struggle through a layer of cover crop residue would work. "The question was: Can we find a cover crop management system that provides some amount of weed suppression without causing a problem for the crop? Edamame is far more sensitive to soil conditions during emergence than grain-type soybean," he says. 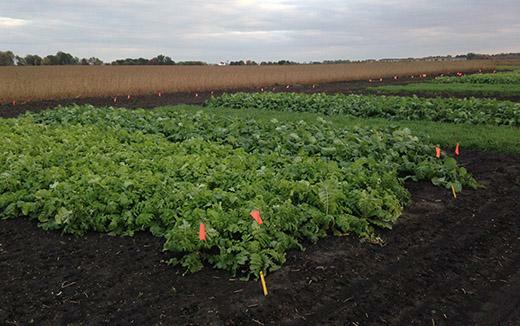 Williams and his research team conducted a three-year field experiment testing 11 edamame cultivars and multiple fall-seeded cover crops: oilseed radish, winter canola, and cereal rye. Radish was killed by winter temperatures, and the researchers applied early (April) or late (May) burndown herbicide treatments to kill canola and rye at different growth stages. For all of the cover crop types, the researchers were looking for edamame emergence and weed suppression. Only early-killed rye offered the right combination of conditions to suppress weeds and allow edamame to emerge easily. Others allowed emergence but didn't control weeds, or suppressed both weeds and edamame. "Early-killed rye resulted in a relatively thin layer of cover crop residue. With thicker layers of residue, you start to have problems with crop emergence. But with no cover crop residue, there's no weed control benefit. Early-killed rye provided the sweet spot," Williams says. Williams acknowledges that early-killed rye alone won't be a silver bullet for weed control in edamame. "Clearly, this work doesn't mean we can grow edamame without other weed management tools. Cover crops are just one of many little hammers. By reducing weed density and weed growth, we know we're headed the right direction." The article, "An early-killed rye (Secale cereale) cover crop has potential for weed management in edamame (Glycine max)," is published in Weed Science. Williams' co-authors include Laura Crawford and Sam Wortman, both affiliated with U of I at the time of the study. The work was supported by the USDA Agricultural Research Service.